Sirasa TV1 initially stimulated the writer and wife to visit Habarana, when a little seven-day-old girl was mauled by a dog and died. Upon arrival in Habarana, it was found that the entire area, consisting three villages, Asirigama, Eppawala, and Haba Divul Wewa, did not have pure water for consumption, as a consequence the number of chronic kidney disease (CKD) patients was on the increase. 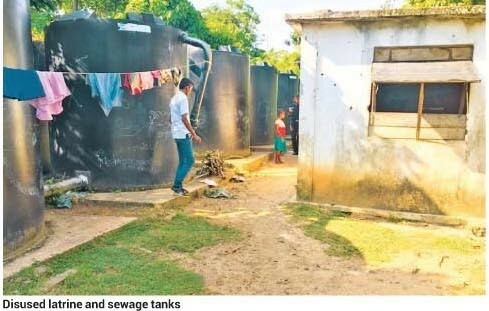 It was revealed further, that these villages require a water purification unit (RO Plant) that is normally installed by the Sri Lanka Navy. In this respect, a detailed report indicating the current percentage of the CKD patients and so forth (covering all villages), is being prepared with the help of the Samurdi Officer, Dhanapala. He has undertaken the responsibility to obtain signatures from the full gamut of villagers, and post the petition direct to the Gammedda Secretariat, for onward transmission to the Sri Lanka Navy for their vetting purposes. Such experiences increased the tendency of the writer towards concentration of the deprived and neglected in the Matara District, focussing particularly on one poor family, with three young kids, (shown on TV1), who has been discarded and abandoned completely for the past two years, and living under atrocious conditions in the rural village of Midigama, in Weligama. Today, the LTTE terrorists have been eliminated and the country is supposed to enjoy freedom of speech, and people are able to move about freely. However, what is appalling was to come across a Sinhala family in Medigama, having to live in ‘latrine conditions’, due to deprivation. 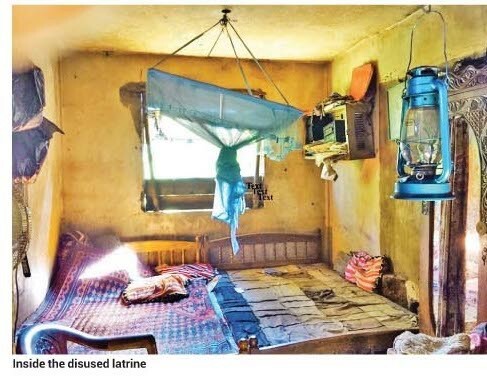 In this confined, disused latrine, they have managed to squeeze in two single beds, two plastic chairs, a ward robe and a wall rack, where a small battery operated radio keeps them entertained; a kerosene lantern supplies light in the night, and a mosquito net, hanging from the roof, protects them from the debilitating viral disease – dengue fever. Eighteen giant type sewage tanks, in two rows, that collect all toilet waste from the area, surround this disused latrine. The family is frequently subjected to inhale the fumes that emanate from those sewer tanks; the worst being the family is forced to put up with the stench, which their nasal cavities have got accustomed to! The gloomiest aspect of all this is, that this family does not have any toilet facilities, nor water for their daily consumption, but having to depend on neighbours for toilet amenities and water. Poverty is certainly the lack of material possessions or money, but outright destitution is the complete lack of means that are necessary to meet the basic personal needs such as food, clothing, and shelter which, in the case of Chaminda Prasanga, labourer, and his wife P. Chandanie, along with Charuka (8 years), and two young girls Tharusi (6) and Jennet (3), are compelled to bear the brunt. Considering this pathetic situation, the Government officials and the local authority cannot escape, but having to conceal their heads in shame, because it boils down to downright violation of human dignity, and denial of basic capacity for this discarded human beings to participate effectively in society. The two little girls apparently attend a neighbouring school, while the malnourished mother looks after the youngest child. One needs to witness personally the atrocious conditions of such degrading human living. The writer has, therefore, taken the initiative to contact his worldwide acquaintances and charitable organizations, in liaison with the Sirasa Gammedda Secretariat, to organize and build a small house for this family. The plan has been drawn up for the house, and the estimated cost, including eight perches of land, will be around Rs.1.8 – Rs.2 million. 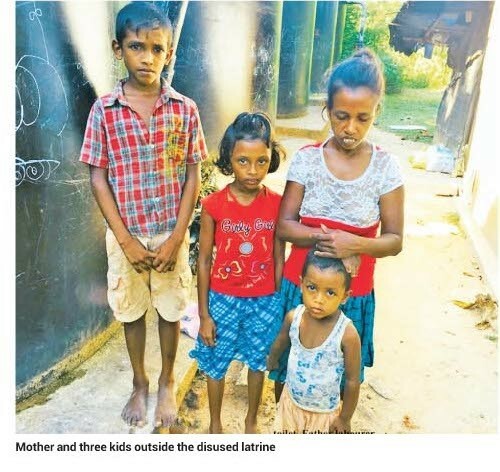 There are so many Sri Lankan expatriates around the world, who would like to help and come forward to help this unfortunate family in many ways, to relieve them out of such woeful conditions. The construction of the house will be undertaken, controlled and overseen by the Sirasa Gammedda Secretariat, at a minimum cost, by cutting expenses to the bone by their stringent auditing department, so as not to waste a cent unnecessarily. In the meanwhile, a Sri Lankan friend of the writer in Melbourne has kindly offered to broadcast this pathetic story and an appeal through a Sinhala Radio programme in Melbourne. He has also undertaken to export the necessary solar panels to the new house, free of charge, so that this family will not have to incur any electricity bills once occupied. Any compassionate individuals, who would like to be part of this meritorious deed, may contact the writer through email, who will be pleased to guide and provide whatever information one needs.